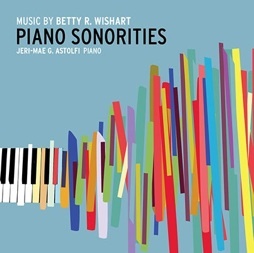 Piano Sonorities: Music By Betty R. Wishart is the first recording of Ms. Wishart’s solo piano music on the Ravello Records label. 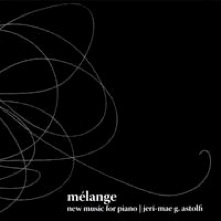 The music is performed by award-winning pianist Jeri-Mae G. Astolfi and highlights the composer’s use of distinctive harmonic structures, tension, and space. Wishart makes extensive use of intervals of seconds, fourths, and sevenths in her music as she explores various facets of the human condition. The music on this album ranges from rhythmic and playful to very open, free-form pieces that will obviously affect different people in different ways. Wishart’s music has been performed in Europe, South Korea, Russia, and throughout the US in diverse venues and institutions. She is a member of the music faculty at Campbell University (North Carolina) and has received awards that include American Pen Women, Composers Guild, and American College of Musicians. This is the first time I’ve heard Betty R. Wishart’s music, and while it is fascinating, it won’t suit everyone’s musical taste. If you are looking for music akin to artists like David Lanz or Robin Spielberg, this album most likely won’t do. However, if you enjoy contemporary classical music that is more challenging and intellectual, keep reading! 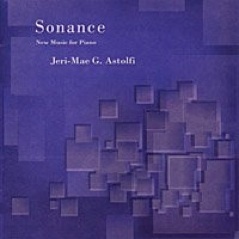 Jeri-Mae Astolfi is my favorite classical pianist. She is an ardent supporter of new music and has commissioned and recorded the music of several contemporary composers - including Phillip Schroeder - as well as a variety of compilations and collaborative works. Her repertoire ranges from the Renaissance through the present, and she has been the recipient of numerous performance and research awards and grants. Dr. Astolfi has received invitations to many regional, national, and international music forums, where she has premiered and lectured on new piano music. She frequently serves as a piano clinician, coach, and master class instructor and is currently serving as an Artist in Residence at Piedmont College in Georgia. 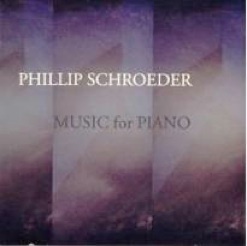 There are twenty-four tracks on Piano Sonorities due to several multi-movement works that include “Sonata II” (three movements), the four-part “Night Visions Suite,” and “Variations on a Folk Melody” that includes the theme and twelve variations. The album also includes two Toccatas, “Sonata: Adagio-Scherzo-Adagio,” and “Remembrance. I especially like “Toccata II and III” and “Variations on a Folk Melody.” “Toccata III” is dark and energetic, in constant motion after a brief fanfare at the beginning. The thirteen parts of “Variations on a Folk Melody” flow from one to the next, and each variation builds on elements found in the theme while exploring polytonality, contrapuntal devices, and a variety of pianistic possibilities. They vary widely in mood, dynamics and texture, from reflective and still to very joyful. I LOVE Variation 7 despite the fact that it only last 36 seconds! “Toccata II” is also very lively and intense and clearly demonstrates Astolfi’s extraordinary virtuosity. Piano Sonorities is available for download from Amazon and iTunes.